It was this time last year that the Warner Bros. Harry Potter Studio Tour opened its doors to the public, giving visitors the opportunity to come face to face with the real life props, costumes and sets of one of the most successful fantasy series of all time. Harry Potter was a hit the moment the first book was put on the shelf, which in turn lead to six more novels and eight feature films. As Harry grew up from boy to man, so did all the fans who up grew up with him. We love the characters so much, whether it be the golden trio, the professors, and yes, even the bad guys. But isn't there some characters that we're missing out? What about the furry beasts that graced the screen? No, I'm not talking about Hagrid. I'm talking about the much loved pets of our much loved heroes. Just imagine where Harry would have been without his snow owl Hedwig, or how lonely Hagrid would be without his drooling companion Fang. And just think how perceptive Crookshanks was when he figured out that Scabbers was in fact a rat of an entirely different sort. I love going to conventions and meeting all the actors from the films. My best experience was probably when I met James and Oliver Phelps for the first time, and got their autograph. But I would equally love to get the opportunity to meet the animal actors on the show too. When I went to the Warner Bros. Studio Tour last year there were tons of great things to see. As the big door to the Grand Hall opened, I entered a magical world. My favourite part was seeing all the costumes. Among other things, there was one section that talked about the animal actors in the films. There were several for each role, and each were trained for different tasks. 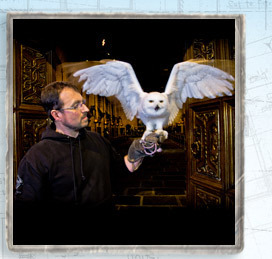 For example, one of the owls that played Hedwig was filmed for flying scenes, while another was filmed for performing with Harry. They also had back up animals that were trained as stand ins if needed, but never actually made it in front of the camera. I found this all fascinating, and wished I could actually see the animals in action. Well now we can. For a short time at least. Between the 25th May - 2nd June, the animals from the Harry Potter series will be making a special appearance. While there, you will be able to have your photo taken with Hedwig and Pigwidgeon, discover how the moving cat plates in Umbridge's office were made, find out how Scrabbers and Trevor were trained, and ask the professional handlers any questions you may have. Tickets to the studio tour are £29 for adults and £21.50 for children, but you can also save money if you buy a package deal which includes an audio commentary and souvenir guide. At the end of the day, if you can't bare to say goodbye, then stop off at the gift shop and buy yourself a soft cuddly version all your own.